The De Long Islands are an uninhabited archipelago often included as part of the New Siberian Islands, lying north east of Novaya Sibir. Bennett Island is the largest of the islands of the De Long group in the northern part of the East Siberian Sea. The area of this island is approximately 150 square kilometres and it has a tombolo at its eastern end. The highest point of the island is 426 metres high Mount De Long, the highest point of the archipelago. Henrietta Island is the northernmost island of the De Long archipelago in the East Siberian Sea. Administratively it belongs to the Sakha Republic of the Russian Federation. Jeannette Island is the easternmost island of the De Long Islands archipelago in the East Siberian Sea. Administratively it belongs to the Sakha Republic of the Russian Federation. Charles Winans Chipp was a United States Navy officer and explorer. William Friedrich Carl Nindemann was a German-born American Arctic explorer and recipient of the Congressional Silver Medal. The Jeannette Monument is the largest monument in the United States Naval Academy Cemetery. It memorializes the 1881 loss of USS Jeannette while exploring the Arctic ice. Jeannette, with a crew of 33, collapsed and sank under surging ice in the summer of 1881. 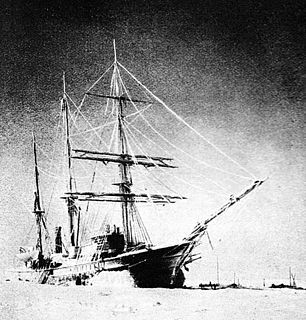 Her crew, commanded by George W. DeLong, took to the ice dragging three small boats. When open water was found, the boats were used to sail to the Lena Delta of Siberia, 700 miles distant. DeLong commanded a boat of 14 total crew members, Executive Officer Charles W. Chipp's boat's crew was 8 total crew members, and Engineer Officer George W. Melville's boat had 11. Chipp's boat was lost at sea with all hands. Engineer Melville's boat landed in the southern delta, and DeLong's boat came ashore farther to the north on 17 September 1881. Melville quickly found aid, as did the two hardiest sailors of DeLong's crew soon after. The 12 remaining, including DeLong, perished from starvation or exposure. Thus 20 of the original 33 did not survive the expedition. In The Kingdom of Ice: The Grand and Terrible Polar Voyage of the USS Jeannette (Doubleday), 2014, is a non-fiction book written by the author and historian Hampton Sides. The book tells the true story of the 1879–1881 arctic voyage of the USS Jeannette and the crew's struggle to survive after having to abandon their ship in the polar ice.